← Introducing my newest office coworker, Bella Tiberius Dixon. On January 27, 2017 I shot a performance for The Late Late Show with James Corden. It aired the night of February 2 (actually 12:37 am February 3). Here’s how it all went down. 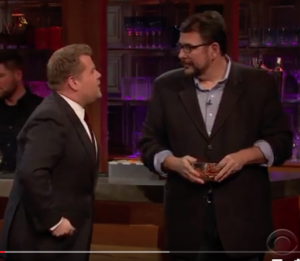 A few months back one of my favorite show biz buddies appeared on The Late Late Show with James Corden. After the show airs, he suggests I submit a few videos to the show for the segment. The show segment is called Stage 56 Bar Tricks. Four different performers come on and perform feats ranging from challenging juggling, balancing or just plain silliness. I noticed that no one has done an actual magic trick for the show — plenty of juggling stuff, but not magic. Now I realize it’s probably because they were not filming the segment yet, much like nobody buys Christmas trees in July, so I send another clip a few weeks later. In this submission, I spread a deck of cards on the back of my right hand and forearm, then flicked my right arm up, causing the cards to fly in the air, and I catch the cards with my right hand without dropping a single one. Oh, and one more thing. Before I did this I soaked the cards with lighter fluid and lit them on fire. I email this to clip to the show booker and got a response the same day. On January 20 I get an email from the show asking me if I’m available to tape on Friday January 27th to do …the pretzel trick. I thought the fire trick would be their first choice, but it’s their show. So I’m booked! The show guests were Bill Paxton and Mindy Kaling, plus surprise guest …Queen. Yes, I will now be able to tell my grandkids “Queen was my opening act on national TV”. They won’t believe me either. In the Bar Tricks segment, four people are brought on to perform their trick or stunt. One of them is “voted off” the show and escorted off by actors dressed like night club bouncers. It’s a hilarious exit and is part of the funny of the segment. Is it a real competition? No. My friend, Mark Hayward, who is a world champion yoyo guy, was escorted off when he was on the show. All performers on this segment go into it with that knowledge and realize that if they’re are the one escorted off, it’s an opportunity for more funny. When I arrived and met the other three talented performers — 2 jugglers and a strong woman who would bend a frying pan with her bare hands — I knew I was going to be escorted off. Why? Juggling and strength exhibitions climax with “Look what they did!” Magic, at least in this very brief context, ends with a “How in the @#$ did he do that?” In the 60 or so seconds allowed for each performer that difference alone made me the logical choice. Again, it’s not a real competition and if I’m not a pro and play along, the show suffers. We go through a couple of rehearsals. Everyone does well. James Corden is friendly and likable behind the scenes as he is on the show. The crew are not only total pros, but totally friendly pros, particularly, the show booker. I can’t imagine how many plates this guy has to spin, but he keeps them all spinning while at the same time making everybody feel like a million bucks. The four of us are escorted to the studio and marched out one at a time to do our thing. I was second. Here’s the clip, starting with Corden’s segment introduction and with all four performers. Thanks for watching! And if you need someone to do magic with pretzels (or anything else for that matter), you know where to reach me.